This is an insanely delicious pasta sauce which is completely addictive. Make it for a date-night or impress a crowd of dinner guest. Serve with angel-hair pasta to really get the most out of this lusciously creamy and decadent pasta sauce recipe. Fry finely chopped garlic and onion in oil until translucent. Reduce the heat. Add finely chopped dino kale, cashew nuts and crumble dried mushrooms into the pot. Add oat cream/non-dairy cream and stir. Crumble the veggie stock cube into the sauce, stir and add salt, pepper, lemon juice and nutmeg. Reduce the heat further. Gently cook on low heat under a lid for about 10 minutes. Stirring occasionally. Mix the sauce with a hand blender until smooth. Add truffle oil as preferred and taste with additional salt and black pepper. 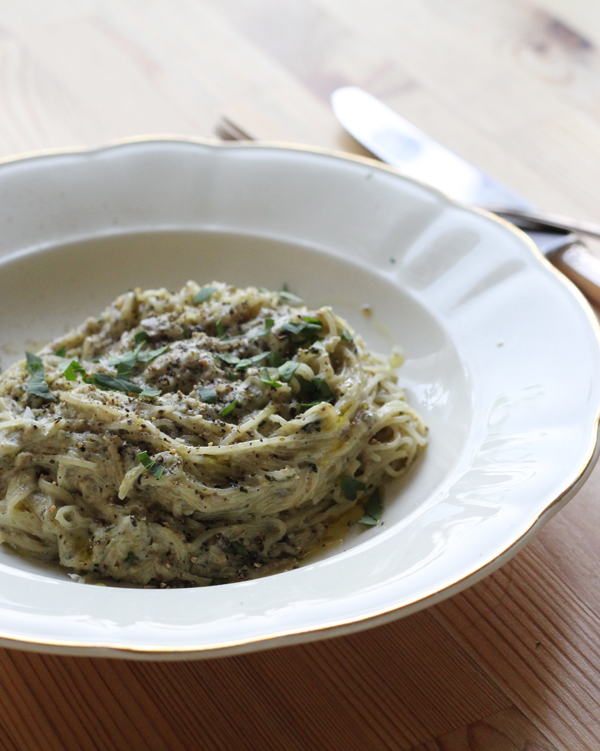 Serve with finely cut herbs and additional truffle oil sprinkled on the top of the pasta.